The 'World T20' is starting to highlight one problem in women's cricket which I have hinted at before and which is becoming more glaringly a problem day by day. As the Bible says "to them that hath shall be given, and them that hath not, even that which they hath shall be taken away". Ireland captain Laura Delany said: “Pakistan are closely ranked to ourselves, so that was the obvious target that we were going to go after. It was almost a forgone conclusion that the teams with cash, and therefore whose players can devote themselves full time to the game, were going to breeze away with this tournament, and those who are generally amateur were going to struggle. It's hardly sensible to expect anything different. Ireland, not unreasonably described themselves recently as "the best amateur side in the world". It would be hard to gainsay that, and if you agree then it's a fine achievement for them to be here (in St. Lucia) at all! Unless something is done, and the ICC would seem to be the only organisation with any power or cash to do it, the current pecking order may as well be carved in stone. International cricket could become (is all ready becoming?) so predictable that any excitement at the prospect of watching a series or a tournament like this WT20 will just fade away. America's NFL is exciting precisely because, at the beginning of each season, the 'draft' has to a fair extent evened out the playing field. When I start watching in the autumn I have very little or indeed no idea who will be playing the Super Bowl, let alone winning it. Women's cricket risks taking exactly the opposite path and loyal supporters of the top sides may enjoy the thumping of the minnows. But what pleasure is there really in that, compared with a real contest when everyone has to fight? Winning then starts to have a real meaning! England v South Africa and other thoughts. It's been a strange day at the Darren Sammy Stadium in St. Lucia. In the first game, in which England were embroiled, they seemed to play with rather more confidence that in earlier matches. By way of contrast, South Africa looked shell shocked and IMO did not play to anywhere near their potential. After their performances in England during the summer, although again short of what a line-up like that should be capable of, I have expected more of them. The game nonetheless had an interesting milestone, the most significant for me being Danni Wyatt passing 1,000 in IT20s. 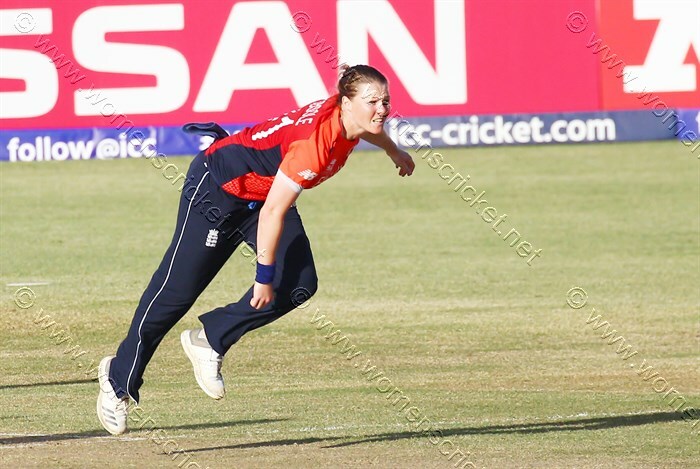 And it would be remiss not to mention Anya Shrubsole's hat-rick. They are like hen's teeth in WT20 tournaments, and while it was a mopping up of the tail, take nothing away from her it still has to done, and Anya was clinical. No one approaches being a T20 opener quite like Danni. She figured a while ago that runs at speed was her job and, without checking, I'd be surprised if her IT20 strike rate is below 100 - it was 100 exactly in this knock. I have watched her bat many times, including for 'my' county Sussex, and 'no fear' is the only way she knows. 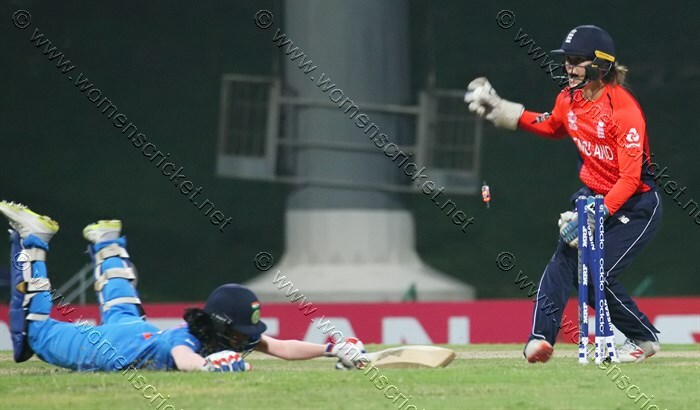 Hence when Danni walks to the wicket, you should brace yourself as almost anything can happen. It maybe 3 off 2 balls or a more than run-a-ball 50, but while she's still there, excitement is guaranteed. After the last 12 months it's tempting to think England may as well start carving "Danni Wyatt opening" in a block of granite! That match was followed by West Indies, who batted first, against Sri Lanka. I think everyone feared for the Sri Lankans. When West Indies looked early on like passing the 200 mark one wondered if expectations were to be fulfilled but in the end they fell short. What was going to be Sri Lanka's reply? Well they copied their opponents and simply went for it. No point dying prodding - let's give it a whack - and they duly did. As I type Sri Lanka need another 100 in 7 overs. Yes, I know it's not going to happen, but I raise my cap to them - they didn't buckle - they gave it what they had - and I have to say they are the first of the 'minnows' to show real intent in what they must have known was a losing cause. After this performance they have nothing to be ashamed of! As you all know by now I 'blog' (horrible word) somewhat intermittently. I have neither the skill not the patience to write (as does, say, Raf Nicholson currently writing for The Guardian) match reports, previews etc with great regularity. The mood has to strike me and yesterday, at the stadium in Antigua it did as I watched England take on India. What brought this on? Well, it was the desire to see England win in a match I felt they had every chance of losing. It's not that I am trying to decry England's skills, it is, quite simply, the opposite; that India are a fine balanced team, with, one might have said, "every base covered". They have electric strikers in Mandhana and Kaur and no side in the world can boast two at that class, and their spinners, in what we all knew would be a low and slow wicket, would be a force to reckon with. But games do not always go the way one might think, especially I guess in the T20 format and I must single out two players who ensured England quietly and efficiently took the game away from India. Having contained India to a far lower score than anyone could have reasonably expected (113) England lost two early wickets and English supporters hearts must have sunk. The Indian total was constrained in considerable measure by some excellent fielding and, after some very poor catching in a previous match, that finally came together in this performance. However, with the loss of the England openers the game changed. Two batsmen looked at the scoreboard, took stock of the run rate at around a run a ball, and batted with their heads as much as their bats. Few great flourishes occurred and I recall sitting on the edge of my seat muttering the mantra "milk it, milk it, milk it!" as singles were on offer around the ground. Sciver and Jones obliged, enlivening things with the occasional boundary. I felt particularly for Amy Jones. Nat Siver is a hardened campaigner by now but I've often wondered if Amy feels she's the understudy for... well we all know who! If there is such a thing as coming of age at cricket then perhaps this was it. At the end of that knock on 53* and with the Player of the Match Award, Amy need feel an understudy no more (indeed if she still did!). 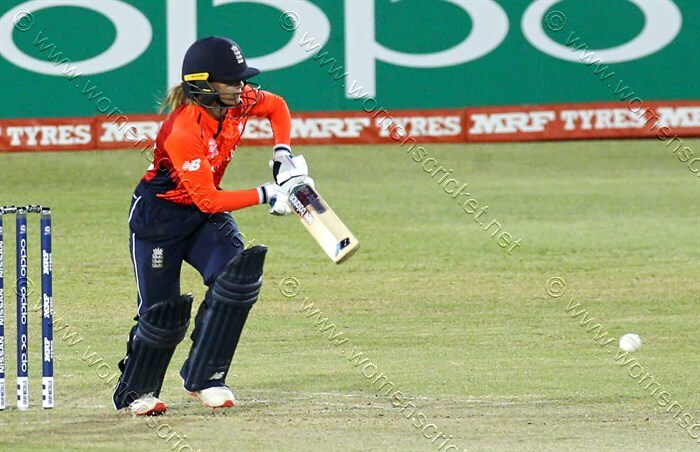 In that performance, even if not flawless, she showed she's an England keeper, and keeper/batsman too. Who'll be behind the sticks in the summer of 2019? I guess much will depend on Sarah's health and indeed her match fitness too, but whatever the situation England don't need to shop widely for a keeper. We know exactly who can do the job! I cannot think of higher praise, indeed is there higher praise(? ), for the performance of Jones and Sciver than to say it was truly professional! As seems to happen so often in major tournaments, the 2017 World Cup being a glorious exception, the final of the WT20 ended not so much with a flash as with a whimper. Unlike the 'professional' approach of Jones and Sciver in the match against India, England only really turned up in the form of Danni Wyatt. In T20 cricket you need a run-a-ball innings as a very minimum. Only Wyatt (and ironically England's number 11) managed that. I understand the caution of later batsmen once the wheels had started coming off but in the end the 6 an over is a mantra you have to follow. The result, not surprisingly, was that it was Australia's turn to play the professionals and show their superiority by knocking off the total with all but 5 overs left. It was all just far too easy in spite of the efforts of the England bowlers. The England captain says they need to reflect before planning for the summer when the Ashes loom. She's not wrong! Although it's hard to see what England can pull out of the woodwork before then. I fervently hope I'm wrong but it could be a long hard summer for England supporters.